Carroll & O’Dea Lawyers are honored to host The Hon. Julia Gillard. 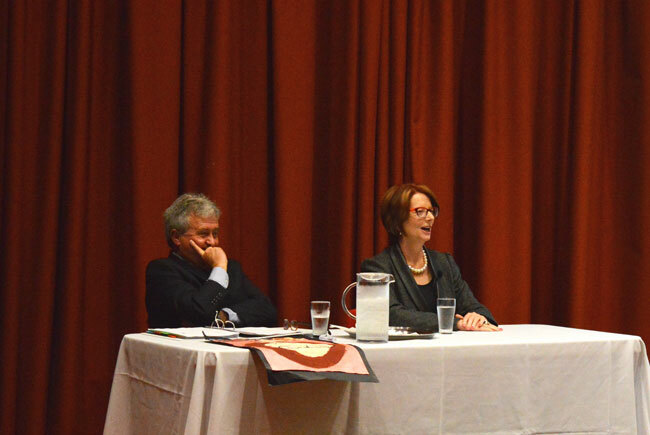 Ms. Gillard graduated from the University of Melbourne in 1987, with a Bachelor of Arts & Bachelor of Laws. Upon graduating Ms. Gillard commenced at Slater and Gordon becoming a partner in 1990. In 1998 Ms. Gillard won the Federal seat of Lalor for the Australian Labor Party. In December 2006 Ms. Gillard was elected Deputy Leader of the Australian Labor Party. Following the Australian Labor Party’s victory at the 2007 Federal Election, Ms. Gillard was sworn in as Deputy Prime Minister, and the Minister for Social Inclusion. On 24th June 2010 Ms. Gillard was sworn in as the first female and 27th Prime Minister of Australia, holding office until 2013. In recent years Ms. Gillard has been appointed Honorary Visiting Professor at the University of Adelaide and has received an honorary doctorate from the Vrije Universiteit Brussel. Julia Gillard is chair of the Global Partnership for Education and is a Senior Distinguished Fellow at the Brookings Institution in Washington. She is a member of the board of Beyond Blue. Note, the date of this event has passed. You can no longer book.